It's time for the final few reading updates of 2016! 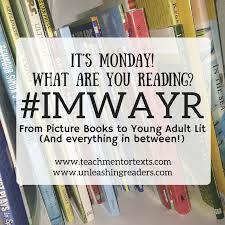 IMWAYR (Kid lit version) is a meme hosted by unleashingreaders.com and teachmentortexts.com. Today I'll be sharing with you the progress I've made on my Goodreads Challenge as well as the reading I've managed to finish this week. I had planned on reading 100 books this year. Unfortunately, it seems like that won't be a possibility. I'm currently reading my 90th book, so I'm hoping to finish 95 books this year. It's a little bit disappointing to finish five books away from my goal, but my goal is still ten books more than what I read last year, and progress is what counts, right? 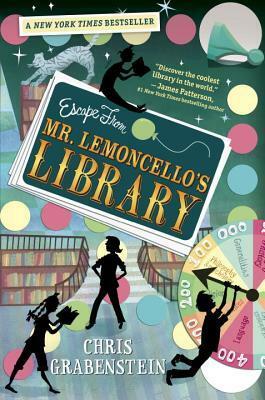 I read "Escape from Mr Lemoncello's Library" by Chris Grabenstein this week. I needed a fun, light read, and this comical middle-grade novel gave me just that. I was surprised by how much I enjoyed the book, and it reminded me that sometimes we just need to take a break from heavy fiction. I also read "Missing You, Love Sarah" by Jackie French. The book was okay, but definitely not one I'd read again. If you're looking to start reading mystery and crime novels, this might be a good one for you, but I found it too predictable after having read various other novels in the same genre. I finally finished reading "Attachments" by Rainbow Rowell. Someone in the comments last week reminded me that Rainbow Rowells' books aren't all as good as "Fangirl" and "Eleanor and Park". This book certainly helped to prove her right. I don't think it was as good as either of the above books, and was left slightly disappointed with the conclusion. I'm currently reading "My Heart and Other Black Holes" by Jasmine Warga. This is about a young girl who needs a partner to help her commit suicide and what the two friends start to mean to each other. I haven't reached very far in this novel, so I can't say much about it, except that a trusted friend convinced me to try it. I've officially put a pause on reading "I'll give you the Sun". My Kindle Cover hasn't arrived, and I'm quite a clumsy person, so I'm trying to avoid reading on my Kindle until there's a cover to protect it from scratches and falls. I'm quite excited to get back to the book though! Hope you all have a great reading week! And remember to try out for the Goodreads Challenge Next Year if you haven't thought about doing so already. I love Mr. Lemoncello's Library! There is a sequel but I haven't read it yet. I hadn't realized that the Lemoncello book had a sequel- thanks for letting me know. I might just pick it up next time I'm in a reading slump! When I looked at Missing You, Love Sarah, I knew it was an older title. This kind of cover is so hard to get my students to pick up! I have to remind myself that a book like this is older than most of them are! That's so true, I was doubting it myself when I was in the school library. I think I picked it up just for the sake of trying out something different. I have Fangirl on my #mustreadin2016 list. It's looking like I'm not going to get through all of them. But now you've got me thinking I need to go back and try to squeeze Fangirl in! Thanks for stopping by, and have a great weekend Michele! For next year, I want to actually read less but more books that are good. But then again how would I know if I don't keep reading right? Exactly! That's the best spirit. QUALITY, NOT QUANTITY! Hurrah for light reading like Escape from Mr Lemoncello's Library! Although I do think that while it is a fun read, there is still a lot of important stuff going on. I hope you get to the next in the series. My heart and Other Black Holes looks to be a pretty intense read. I'm going to wait and see what you think about when you're finished before I add it to my list. It means a lot that you'd consider my opinion first! I'll be posting a review sometime next week though, so hopefully you'll have it in your TBR list for next year! Wow...95 books in one year?? That is incredible!! Good for you! Sounds like you've read quite a variety recently. Can you believe I have never read a Rainbow Rowell? I know. I do have Eleanor & Park on my Kindle & can't wait to read it! Enjoy your books this week & the holiday season with your family! You really should try Rainbow Rowell- just as a break in between the heavy reads! It's disappointing to miss the goal. You've read a ton though. :) I've done the Goodreads challenge for a few years now. Sometimes I've had to revise my goal down. Sometimes I pass it. Either way, books are being read. Have a great week. That's the important part- that books are being read. Sometimes the challenge forces you to consider reading when you just don't feel like it. And then you start loving reading all over again! When I cutback on my review commitment this year, I read more of the books I wanted to read but over all also read fewer books. I had set a goal of 100, but don't think I ever made 50. Well, 2017 is another year, right?